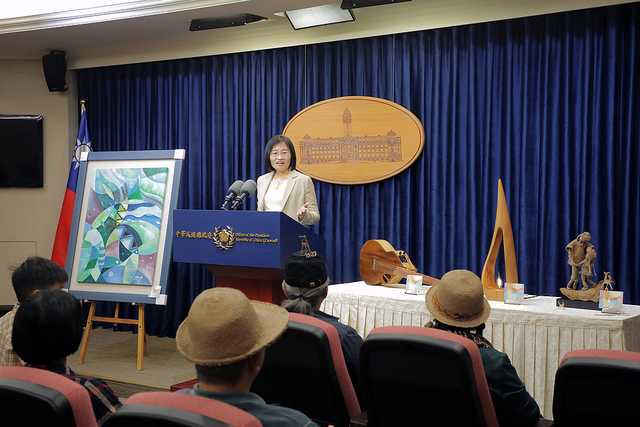 A selection of gifts that President Tsai Ing-wen will present to top-level officials during her upcoming Oceans of Democracy state visit to Palau, Nauru and Marshall Islands was unveiled by the Presidential Office March 19 in Taipei City. The items were handcrafted by celebrated Taiwan artists and spotlight diverse aspects of the nation’s culture, history and natural environment, according to Chang Wen-lan, director-general of the PO Department of Public Affairs. Among the gifts is a painting depicting a traditional Atayal fishing trap by Miru Hayung from the indigenous tribe. Set to be offered to Palau President Tommy E. Remengesau Jr. in recognition of the shared Austronesian heritage between the two sides, the artwork also highlights the ally’s efforts to foster environmental protection and sustainable development. Nauru President Baron Divavesi Waqa, an avid musician, will receive a guitar produced by artisan Talaluki from the indigenous Amis tribe. Made using driftwood that washed up following Typhoon Morakot in 2009, the instrument symbolizes the importance of tackling climate change. In gratitude for the invitation to address the Nauru Parliament, Tsai is to offer Speaker Cyril Buraman a wooden lamp artwork titled “Seeds of Light.” Also made from driftwood, the piece by Amis artisan Iyo Kacaw signifies the body’s role in nurturing the nation through drafting and amending laws. Tsai will present Marshall Islands President Hilda C. Heine with a straw sculpture by artisan Cheng Mei-yu. The piece depicting the mother-child bond recognizes Heine’s status as the first female president in the Micronesian region; the work of her daughter, noted poet and climate activist Kathy Jetnil-Kijiner; and the prominence of straw in the traditional arts and crafts of both countries.